The changing area is optimally equipped with the Puckdaddy changing mat. Practical details such as the removable terrycloth cover allow uncomplicated use in everyday life. The cover can be removed in no time at all and washed effortlessly with press studs at the corners. The combination of soft terrycloth and flowing cotton guarantees a comfortable wrapping for your baby. 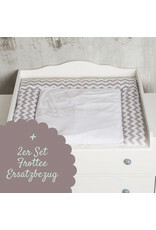 This offer only includes the changing mat, not the chest of drawers and not the decoration. Replacement covers (2 pieces in a set) made of terry cloth with press-stud fastening, suitable for all Puckdaddy Standard changing mats. The covers are washable and thus the ideal addition to keep your changing mat clean and hygienic.